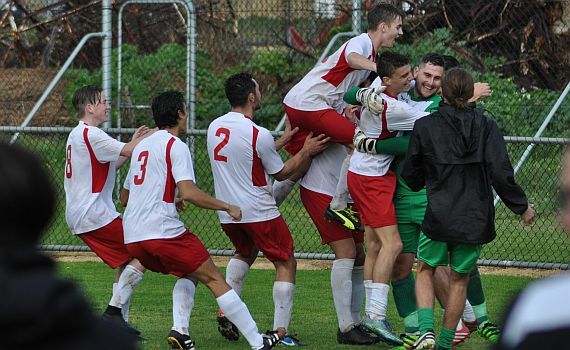 ECU Joondalup moved into the Cool Ridge State League Reserves Cup Final after a dramatic penalty shoot-out win against Stirling Lions at Macedonia Park. James Owen gave the young Jacks the lead from the penalty spot early in the second half, but Paul David equalised for the Lions deep into stoppage time to send it to a penalty shoot-out. Keeper Todd Hoyle was the hero saving a penalty, and ECU scored all five to win 5-3 on penalties. Stirling opened the brighter and went close early Endalk Achamyeleh sent Damien Simic in on goal, but Hoyle stood tall to deny him. Simic was in again on the quarter hour, but his attempted lob was well claimed by Hoyle. ECU were struggling in the final third, but they went close three minutes before half time, Ollie Annis’ free kick deflected off a Lions defender, the ball hitting the post and away to safety. After the break it was the Lions again who went close, Simic’s long-range shot was superbly saved by Hoyle. But on 54 minutes the Jacks hit the front. Ollie Annis was brought down in the area and referee Brendan Skinner pointed to the spot. Owen kept his nerve and sent Lions keeper Connor Campbell the wrong way to give them the lead. ECU were hitting on the counter attack and Jonny Hulme was a constant threat down the left and the hour he raced clear, cut inside his marker but his shot whistled the wrong side of the post. Hulme was the supplier moments later, this time finding Pollard, whose shot was blocked and cleared. The Lions pressed late and Harry Papalia fired wide, but in the second minute of stoppage time the Lions levelled. Simic’s shot crashed off the post, David follow up shot was superbly saved by Hoyle, but the Lions striker fired home the rebound to level. So it was off to penalties and Hoyle guessed the right way to save Achamyeleh’s first spot kick, and Ryan Malton, Stefan Vranesevic, Hulme, Annis all converted. So it was left to Owen to seal the win, and he fired low past Campbell to set of wild celebrations.